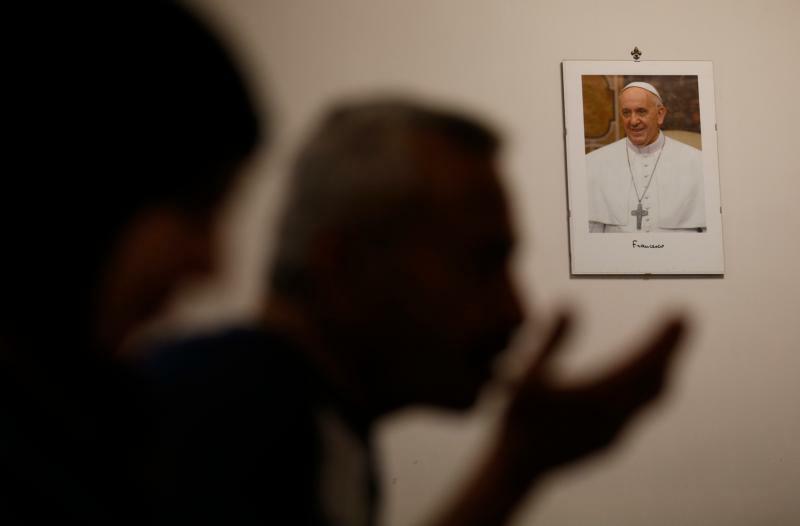 Hassan and his family, who are Muslim, are being hosted by a Catholic parish in Rome. Out of concern for their safety, the family, the parish priest and the Catholic school that welcomed Hassan’s three youngest children asked that identifying details remain unpublished. Likes millions of refugees around the world, Hassan packed up his family to flee violence and to try to find a safe place where his children could grow and thrive. Also like many refugees, his story is much more complicated than that. Hassan is a Palestinian born in a refugee camp in Lebanon. After university studies there, he had a good career as a nurse. Then came the war. He stayed, though, working harder than ever. “Too much blood,” he said. Hassan was shot in the arm; the entrance- and exit-wound scars are still visible. Seeking a safe place to work and to find a wife and start a family, he moved to Libya in 1986. He met and married Adiba, whose father is Palestinian and mother is Egyptian. Hassan and Adiba eventually had four children. Hassan found a job in a hospital and ran a shop for a while. They bought a home and later a small farm. Then came the war. “I always am praying. That is why I am still alive,” he said in the tiny two-room apartment where he, his wife and four children live. A Catholic parish answered Pope Francis’ call for every parish to take in a refugee or refugee family. While there is a small refrigerator and microwave in the apartment, there is no space to cook, so the family goes to the parish each day for lunch, traditionally the Italians’ main meal. The children do their homework on their bunkbeds. The school requires every student to have a laptop computer, which was a worry for the family and parish. But Pope Francis, through his almoner’s office, provided what the kids needed. The parish provided the Wi-Fi connection. Hassan — and his wife and children — see their lives as being in Sweden, where they have friends and relatives and had spent 15 months making a start for themselves. That ended shortly after the Paris terrorist attacks in November. Father Marco, pastor of the parish hosting the family, calls them “victims of the Dublin Regulation,” a European Union agreement that refugees must apply for asylum in the first EU country they arrive in and wait there for their cases to be heard. In the aftermath of the Paris attacks, governments that had not been enforcing the agreement took steps to do so. Paying 4,500 euros (just over $5,000), Hassan and his family had boarded an overcrowded fishing boat in Libya Sept. 5, 2014. With 350 other people, they bobbed around the Mediterranean for four days until they were picked up “by the Italians with a big ship” and taken to the port city of Bari. “They took our fingerprints, then they said, ‘You are in Europe. You can go,'” he said. Hassan and his family went by train to Milan, then paid people, who turned out to be thieves, to drive them north. When they reached Sweden, they applied for asylum. The Swedish government assigned them an apartment and gave them a monthly stipend. The children started school. But after about a year, Swedish authorities phoned to tell Hassan the family had to go back to Italy and apply for asylum there, where they had left their fingerprints. There were letters and meetings and lawyers. “Two days after the trouble in Paris, they came at 5 in the morning and broke down the door,” Hassan said. The police took the family and “many of our things, but not all,” to the airport. In a small plane with 10 police or immigration agents, Hassan, Adiba and the four children were flown to Rome’s Ciampino airport and turned over to the Italian police. They slept in the airport that night and, after meeting immigration officials in the morning, were told they could go. They slept in Rome’s main train station for a couple of nights before hearing about a makeshift center for refugees staffed by welcoming volunteers. From there, they went to a Red Cross shelter where Father Marco and some of his parishioners volunteer. “We are a family and at the Red Cross center, there were many men,” Hassan said. He asked Father Marco to help, and by Christmas they were in an apartment near the parish.